Kansas City Chiefs player Jovan Belcher killed his girlfriend. Then he drove to Arrowhead Stadium thanked his coach for the opportunity to play and shot himself dead in the parking lot. 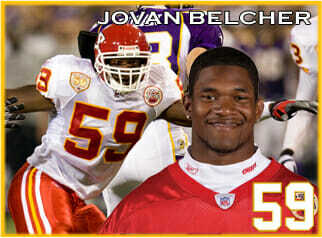 Kansas City Chiefs player Jovan Belcher killed his girlfriend and then shot himself at Arrowhead Stadium. A 25-year-old Kansas City Chiefs player shot his girlfriend early Saturday, then drove to Arrowhead Stadium and turned the gun on himself as two team officials were confronting him, police said. Kansas City police Supervisor Andrea Khan would not release the name of the player involved and the condition of the two parties was not immediately known. Police spokesman Darin Snapp said authorities received a call Saturday morning from a woman who said her daughter had been shot multiple times at a residence about five miles away from the Arrowhead complex. Snapp said a call was then received from the Chiefs’ practice facility. Upon arriving, Snapp said that police witnessed a black male in a car with a handgun to his head talking to two Chiefs officials. That’s when police heard a gunshot. Arrowhead Stadium has been locked down since about 8 a.m. The season has been a massive disappointment for the Chiefs, who were expected to contend for the AFC West title. Jovan became a father on September 11, 2012.